I read the e-edition from Net Gallery.A collection of scholarly essays from the 2013 conference "Catharism: Balkan Heresy or Construct of a Persecuting Society". A scholarly tome for the student of religious heresies and the Inquisition in the Middle Ages. This book is a series of papers presented at University College London and the Warburg Institute in 2013 under the title "Catharism: Balkan Heresy or Construct of a Persecuting Society?" The participants were ostensibly addressing two related questions.First, was there an organized, dualistic Christian group operating in southern France and/or northern Italy in the 11th to 13th centuries possibly with Bulgarian (Bogomil) roots?And second, is there any justification for attaching the name "Cathar" to this group?Those who answered no to both questions held that the only evidence for an organized movement came from the reports of inquisitors and were therefore suspect, and that the name Cathar was plucked from St. Augustine's anti-Manichee writings by Bernard of Clairvaux (in response to a question from an inquisitor) and was never used in the area. These writers claim that what the people in the area were really resisting was growing papal and royal power. Charges of heresy allowed both crusade and inquisition to root out that resistance.Writers on both sides seem to agree that the use of "Cathar" is questionable. The inquisitors mostly use "heretic" in their questions and reports of answers. The heretics might have called themselves "The Good men/people/Christians" -- that is, identifying themselves as the true Christians in contrast to what they saw as a corrupted church hierarchy. 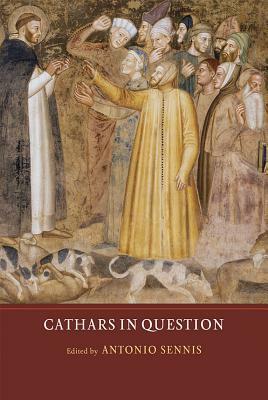 Some writers suggest that Cathar might still be useful as a convenient label for the particular bunch of heretics in that time and place (or those times and places), at least until more is known about who they were, where they came from, and what they believed. So much for the name question.The discussion about whether there was a heretical movement at all and how it originated was much more complex and wide-ranging. And it became much more a debate about contrasting models of historiography (method) than about history (content). Some writers did detailed analyses of a single document or writer. Others scanned great bodies of both primary and secondary sources. Documents called crucial by one writer were dismissed as forgeries by another. Authors critiqued one another's translations from Latin (or Occitan or whatever). [Knowing some Latin is not absolutely crucial to reading this book, but it helps a lot. French, Italian, German, and Bulgarian are less needed.] All in all, this discussion generated a lot of smoke and not a lot of light.My interest in reading this book was based in both histories and historical novels about the Cathars. (My college minor was Medieval History.) I hoped to learn something about what really happened. What I learned could have come from a Magic 8 ball: "Reply hazy, try again." Also, I shouldn't trust anything already in print--not even taking primary sources at face value.For what it's worth, I was disappointed in the very limited interest in seeking an origin for whatever was happening in Italy and France (basically confined to one article whose sources were ignored by everyone else). In a book on Christian dualism, there was no mention of the beginning of the story being told in light of the Gnostic scriptures discovered at Nag Hammadi. But I suppose that when one is debating whether there is anything to study, it seems silly to ask how it got there (if it is there).